The benchmark U.S. corn, soybean and wheat markets are all afflicted by the same ailment: unwieldy supplies. 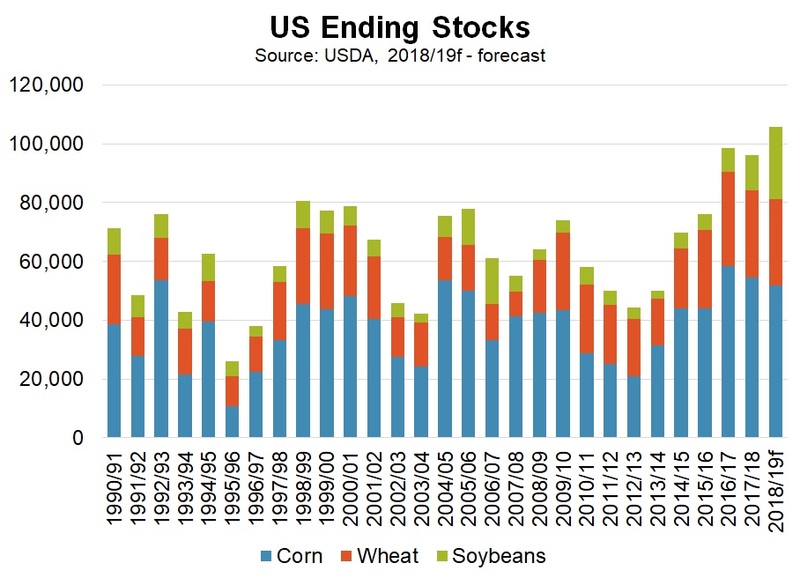 The latest monthly USDA supply-demand update on Tuesday confirmed as much, with 2018-19 soybean ending stocks still holding up near 900 million – about double the previous high – corn ending stocks now creeping over 2 billion bu and wheat ending stocks above 1 billion bu (see graph below). “Right now, American producers have a real struggle with huge carryover supplies,” analyst Brian Hoops of Midwest Marketing Solutions admitted in an MGEX-sponsored crop call. At the end of the day, Hoops said it’s likely going to take significant weather problem somewhere in the world this growing season to inject any real life into moribund markets. What’s worse for corn and wheat is the demand picture is weakening as well. In Tuesday’s update, the USDA raised its 2018-19 U.S. wheat ending stocks forecast by 31.5 million bu from last month to 1.087 billion bu, with the bulk of that increase coming from a 20-million bu reduction in the export forecast to 945 million bu. 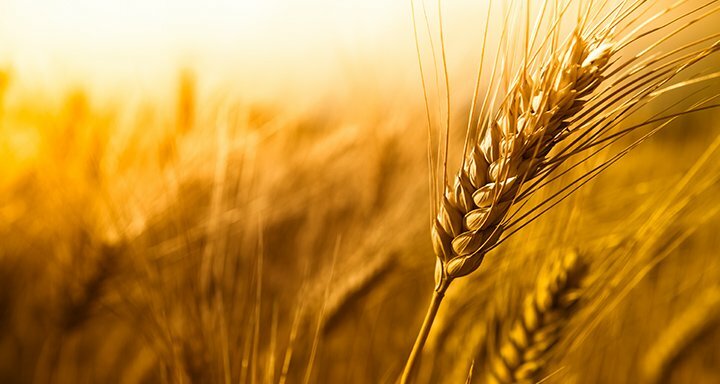 But even with that reduction, Hoops said he believes the USDA’s wheat export forecast is still too ambitious and will likely need to be revised lower in future reports. “There’s 10 weeks left in the marketing year for wheat and on a weekly basis we are well below what we need to be averaging to meet the (current) USDA forecast,” he said. For corn, the USDA cited weaker exports, lower feed and residual use and a drop in the amount of corn used for ethanol as it dropped its 2018-19 U.S. corn ending stocks estimate by 200 million bu from last month to 2.035 billion bu. The outlook for corn is further clouded by the fact last month’s USDA prospective plantings report suggested American producers are already planning to increase new-crop corn planted area by 4% to 92.8 million acres. The USDA did trim its 2018-19 U.S. soybean ending stocks estimate by 5 million bu from last month to 895 million bu, but that minor reduction was overshadowed by a 500,000-tonne increase in estimated 2018-19 Brazil soybean production to 117 million tonnes.